Are you looking to maximize your warehouse space in San Diego? Do you need the maximum utilization of your available space? If yes, you are at the right destination. Now, look no further than Just a Rack- your one stop solution for the high-capacity storage system? We have received high acclamation for designing, manufacturing and delivering trend-setting pallet racks in San Diego. This has inspired us to become more innovative and creative in offering the topnotch quality solution for each common and customized need. We are dedicated to giving the ultimate solution for keeping the heaviest things within your available space. At Just a Rack we design, manufacture and sell a wide variety of pallet racking for the maximum utilization of your available space within a warehouse, office, or retail center. We are open to customization, depending on your needs and available space. We specialize in delivering the regular duty upright and heavy duty pallet racks in San Diego. These are manufactured for commercial and residential uses. These are extremely well for keeping household things and using in your retail stores. Our heavy duty pallet racks are designed for meeting commercial and industrial needs like keeping the heaviest things in warehouses and other commercial centers. Our well-finished pallet racks are designed to increase the storage density of the stored goods. 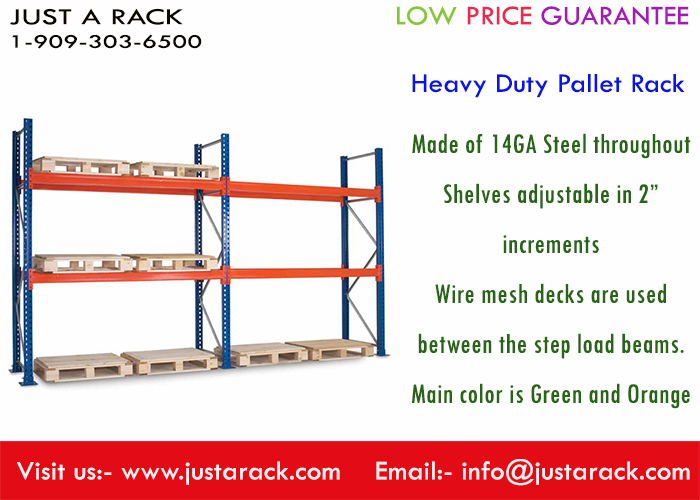 The cost varies, depending on the number of racking and storage density. To ensure strength and durability, we always use high-quality materials. Quality products, on time product devilry and reasonable rates have been the trinity our services. You can book pallet racks online from our official website to receive these at your doorstep. We are committed to ensuring you high-quality products and high-capacity storage system at affordable prices.